Netanyahu and US Secretary of State speak with reporters at Warsaw conference on Middle East, addressing Iranian threat. 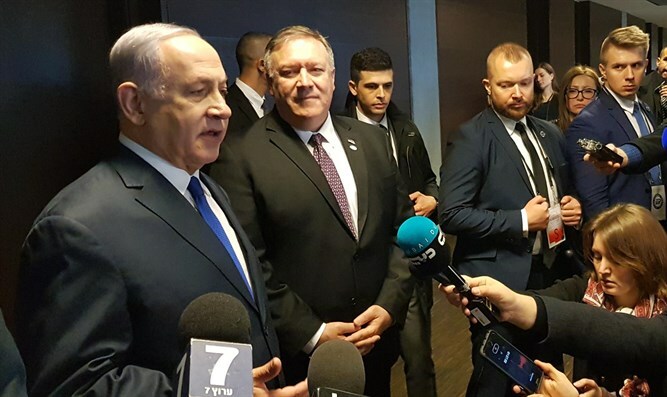 Prime Minister Netanyahu addressed reporters with US Secretary of State Mike Pompeo on Thursday, the second day of the “Ministerial to promote a future of peace and security in the Middle East” hosted by the US and Poland in Warsaw. “I think this marks a change and an important understanding of what threatens our future and what we have to do to secure it, and the possibilities of cooperation that extend beyond security to every realm of life for the peoples of the Middle East. “This happened here in Warsaw, and my conclusion is that it must continue in other forms for the same purpose,” Netanyahu added.